Oh, you had me with, “…mellow it out.” I’ve been seduced. Maybe it goes back to those orange Creamsicles. Nothing better on a hot humid day when you’ve been living large and fast all day long as a kid in Detroit! And you know you’re there in cuisine lingo when you transcend the need for recipes. I’m more inclined to see that as the hallmark. Good recipes can’t be written down because they involve good judgment and second by second innovation by whoever is minding the stove or drain board. 5 Popsicle sticks! Jean, you have been in the mood for ice cream, haven't you? ;-) The more, the merrier! It's velvety, creamy and fingerlicking! Angie, thank you, but I *need* to get in the mood for some lighter fare soon! That looks so delicious! I LOVE homemade ice cream because you can make whatever flavour you want. Haven't tried orange yet, but it's on the list! Thanks, Mr. P! Check my Recipes/Reviews index page for lots of other flavours too. I'm going to make orange frozen yogurt next. I haven't made ice cream in a couple of months and I need to change that. This orange version sounds delicious! Mary, thank you! I hope you'll like it as much as we do! Is that you, Sup? Sorry I spoiled your joke - I'd still like to hear it, lame or not! Mmmmm... orange ice cream! It always makes me think of creamsicles!! P.S... I'm so glad I can comment now!! YAY!! Jenn, I'm glad too! Glad we figured out that technical difficulty! 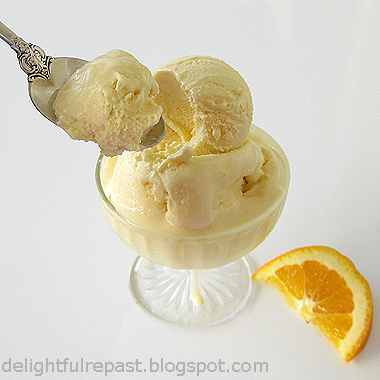 Orange ice cream would be a very refreshing dessert after a meal with one of your wonderful zesty sauces. Hi, Jean! Didn't the mixture curdle because of the acidity in the orange juice? Hi L.D. No, not at all. I made the ice cream exactly as I wrote it down and there was no curdling after I added the juice. 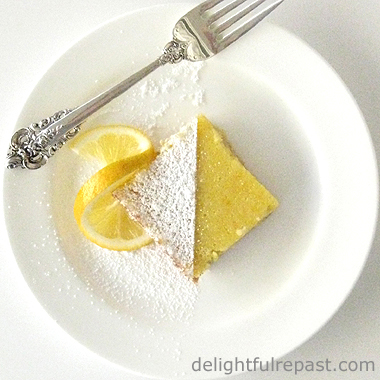 Thanks for reminding me of this recipe - think I'll make some this week!